Juxtaposing images of the production sites of the pharmaceutical-chemical industry with speculations on the historical, social, and material conditions of Cyanotype photography, “Bläue” (Blueness) probes into the (gendered) politics of materiality and the (violent) historicities of its form. In the latent period, when the images are exposed but not developed yet, the figure searches to define their body as both commodity and consumer of pharmaceutical products. This body is modelled on the productive body of Fordist labour. Yet like the industrial sites that appear as remnants of an older mode of production, this body has been fundamentally reconfigured to conform to post-industrial working conditions. Subsequently, the figure aims to perform against pharmaceutical substances and prepare against a neoliberal take-over of their movements, lingering between the roles of researcher, scientist, athlete, pharmacist, patient, woman. 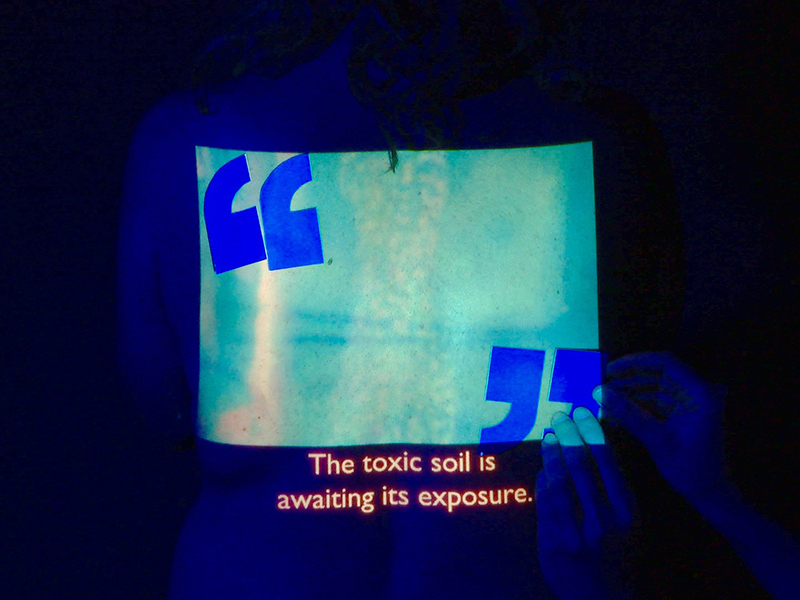 Kerstin Schroedinger is an artist working in video, sound and performance. Her historiographic practice questions the means of image production, historical continuities and ideological certainties of representation. Her works and curatorial practice are often collaborative. Recent works include The Alleged Body (performance), shown at Images Festival Toronto, and Les Complices* Zurich in 2017, Fugue (Film, 2015), as well as Rainbow’s Gravity (Video, 2014, GFTA-funded 2013) and Red, she said (Video, 2011) both with Mareike Bernien. Her work has been shown at the Whitney Museum of American Art, Anthology Film Archives New York, Forum Expanded of Berlinale, Short ٍFilm Festival Oberhausen, International Film Festival Toronto, Gasworks London, Arnolfini Bristol, Whitechapel Gallery London, and exhibited at MIT List Visual Arts Center Boston (2016), Photo Cairo #6 (2017), FMAC Mediathèque Geneva (2016), The School of Kyiv – 2nd Kiev Biennale 2015, Helmhaus Zurich (2015), Kunstpavillion Innsbruck (2017), amongst others.